CD reviews: "Lullabies for Little Dreamers," "When I Was Young: Children's Songs From Ireland," "Teletubbies: The Album," "Blue's Big Treasure: A Musical Adventure" and "Songs From Bear in the Big Blue House"
These reviews first appeared in the July 24, 1999 edition of the American Reporter. It's the midst of vacation season  those wonderful family trips with the young'uns plaintively asking "Are we there yet?" before you've hit the end of the driveway. As our parents learned in the '70s when the technology first came out, cassette tapes (or, now, CDs) of children's music can make those trips by car much more bearable. Some new albums out should go a long way in keeping the little one's minds occupied while you scour ahead for a likely spot that might, just might have restrooms that aren't too disgustingly filthy. While many  heck, maybe most  albums for children can be treacly enough to drive mom and dad over the edge, "Lullabies for Little Dreamers" from Rhino is one that might actually appeal to the drivers a bit more than the passengers. Subtitled "Soft Rock Classics From Your Favorite Stars," it's a case of marketing children's discs more to the parents. Each track is a radio-friendly nugget from the late '60s through the '80s, and are designed to appeal as much to yuppie nostalgia as little one's sleep habits. The artists range from James Taylor to Carly Simon, the Carpenters to Manhattan Transfer, Hall & Oates to Fleetwood Mac. Only two of the ten tracks were ever legitimate hits (Fleetwood Mac's "Songbird" and Cass' "Dream a Little Dream of Me"), but some of the others will be familiar. None really qualifies as a "lullaby," though, and whether the kids are going to be interested in this is questionable  my six-year-old and eight-year-old mostly ignore it. More likely to be passably acceptable to the kids while still enjoyable for the grownups is a new collection of Celtic songs for children. 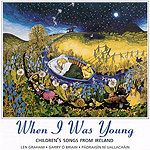 "When I Was Young" contains 28 songs drawn from a tradition in which children's music isn't so very different from grownups' music, where children are considered smart enough to appreciate complex structure and harmonies. The traditional songs draw on topics ranging from courting and love to the challenges of growing up, reminding of a time when music was a way of passing on cultural mores to children, of teaching lessons and imparting wisdom. And there are also songs of whimsy and silliness, those stalwarts of childhood that we adults so foolishly give up. Given the reputation and talent of the trio of Irish musicians who recorded this disc, anyone at all with an interest in Irish music is going to like the album. At the same time, this one held my kids' attention much more than the yuppie excursion above. 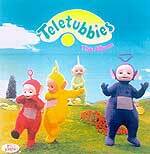 Getting back to our theme of children's albums that can turn an adult's stomach, here come the Teletubbies. The TV program has now spawned an album of music and skits drawn from the series, and it's so sickeningly sweet it makes watching Barney seem like "Waiting for Godot" by comparison. Not since "New Zoo Revue" twenty years ago has there been a show so cloyingly annoying. To adults, that is. The kids absolutely love it. Even my six-year-old wandered in and immediately recognized it (his eight-year-old sister has now joined her parents in hating Teletubbies). The four brightly colored characters run through almost an hour of simple music, stories and silliness that teach basic counting skills and other pre-school lessons. Just as educational and far less obnoxious (to adults) is "Blue's Big Treasure," a half-hour audio version of the Nickelodeon TV show "Blue's Clues." Built around Blue, a large, animated dog, "Blue's Clues" is fun for kids, charming for adults, and full of good sing-along songs perfect for road trips. The CD teaches children how to use their imagination with sound  kind of a throwback to the age of radio. There are clues to listen to to try to figure out the answer to the adventure. In a similar vein is a new set of songs from "Bear in the Big Blue House," a Jim Henson TV show (carried on by his family since his passing). More educational than The Muppets, and aimed at a younger audience, "Bear in the Big Blue House" is full of songs, little games and other fun stuff that ought to keep the kids occupied. And it's not going to grate the adults' nerves, either.